Young and old are encouraged to participate in Hope Academy of the Arts. 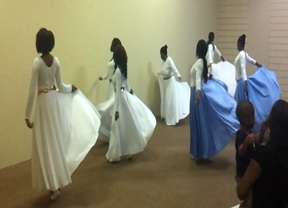 This twelve week program provides training in theatre, dance, arts and crafts, music and the Bible. At the end of each cycle, academy participants present a production incorporating all of their learned skills and arts and crafts projects. Our entire focus for the Hope Academy program is to build confidence and self-esteem in participants of all ages. This program is faith-based and all of the dances, productions and activities are designed to teach Christian living principles. Hope Academy is held on Saturdays from 10:00 am – 2:00 pm. There is a two week break between sessions. This program is absolutely free! All of our instructors are volunteers. Students are only required to cover the cost of their own costuming if it is required. There are three volunteer seamtresses that work with us to produce costuming. Much of the fabric used is donated and/or purchased at a minimal cost. We are always in need of dance fabrics (polyester, light and flowing material). Get involved with Hope Academy today as a participant, volunteer or sponsor!